Derry GAA and O’Neills Sportswear will officially launch the new Derry jersey for the incoming season at 7.00pm on Wednesday, November 18th at the O’Neills Superstore in Magherafelt. 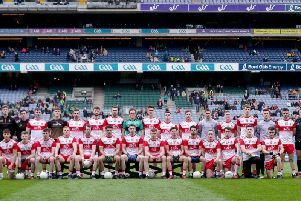 Having announced H&A Mechanical Services as sponsors of Derry senior, Under 21 and minor teams in football and hurling back in late September, Wednesday’s launch will see the local firm feature on the county’s new keenly-awaited jersey design. I’d appeal to all those who follow and support our teams to come along on the evening. “We’re delighted to be launching our new kit and are hoping it will be a big hit with our supporters. We look forward to working with H&A and O’Neills - both proud local sponsors of the GAA in our county - over the next weeks, months, and indeed years to promote and enhance Gaelic games in Derry and to give our teams every chance of fulfilling their potential in 2016 and beyond.